PRIVATE Pet Friendly with large fenced yard. "The World's Most Beautiful Beach!" Clean, Cozy, Comfortable, and Quiet! Big screen Smart tv with Netflix. We know of places to enjoy and avoid! Miracle Strip Water Park 10 minutes away. A family favorite. 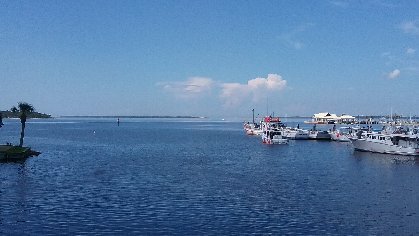 Beautiful St. Andrews State Park, Shell Island Shuttle. Pier Park with dog beach 10 minute drive. A great family room screened in for your comfort and enjoyment! Comfortable and cozy with big screen tv, cable and Netflix. Free internet. Lots of elbow room in this spacious breakfast nook. Easy to keep up kitchen! Very comfortable double bed. All linens supplied. Backyard with fire pit. Large Southern Oak shade tree. Go fishing for the day or spend the day on Shell Island. Swim with the dolphins! Very nice, as always! My dogs LOVE the yard. We have stayed here several times. The grounds are always kept nice. We will be back soon! We stayed a week. Nice cottage like home. Clean, comfortable with huge fenced yard. 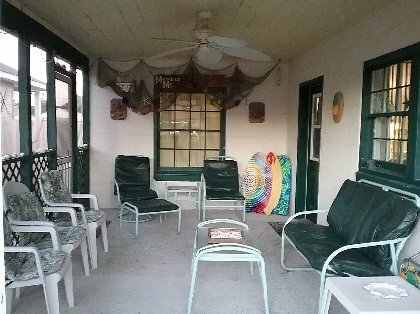 Screened porch with just of wind coming off Gulf of Mexico, sunsets are full of beautiful colors. Located nearby are plenty of food establishment s and nightly entertainment. Better than s condo. I give this 5 stars. We love Diney's house. It is in a perfect spot with plenty of room for us or our family. The pets love it too. It is just a short walk to the beach. It feels like home away from home. Date of visit: Mar 7th-12. We were "wowed" the moment we came in. What a beautiful place to stay versus a hotel. Having the option of bringing our dogs was great. Your home was all we thought it would be. 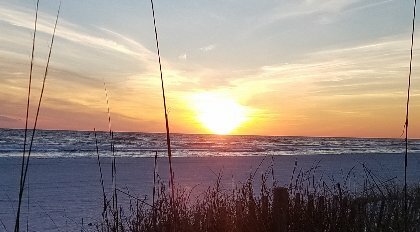 Thank you for letting us enjoy our first trip to Panama City Beach. The weather was hot and beautiful! Our favorite adventures were St. Andrews State Park, Shipwreck Island, and Coconut Maze. Great restaurants we discovered were Spinnakers and Marcus' Gulf Pizza. Thanks Diane. We always love staying here and hate to leave. Date of visit: 6/21 - 6/29. The weather was beautiful all week. We felt so at home here. Thank you so much for the hospitality. Everything we needed was here. Hope our small additions can help the next family. Lots of love and we'll see you next year! Diney was so helpful and nice to us. I really needed her for our family's first trip to Florida! The house was quiet, clean, and very nice. All that we needed was right there. Back yard was fenced and like home, but with sand! We will definitely stay there again next time we get the chance. Thank you so much Diney! Your pizza is the best we've had! I'm always hesitant when booking online but this little house was just wonderful! Very nicely decorated and CLEAN...don't think I can say that enough! All the comforts of home-comfortable beds, towels, dishes, cooking needs, etc... 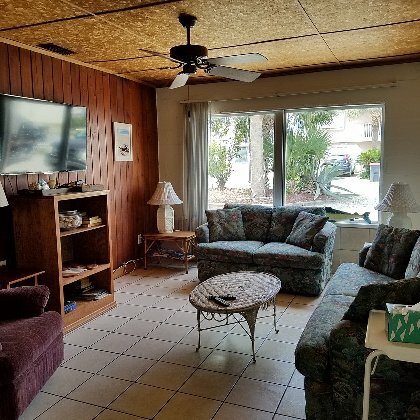 Located in a quiet residential neighborhood yet only 2-3 blocks to the beach. Nice and private, so much better than a noisy motel with people coming and going at all hours. Diane is so easy to work with--very accommodating. The backyard is fenced which was perfect for our dog +the screened in front porch. You cant' go wrong with this sweet little house! This was the best vacation ever!!!! We loved the house, the location and the outdoor shower to assist getting the sand off. Our dogs love the back yard and we all loved the covered patio. As soon as you walk in you feel like you are at home. We have been here several times and will continue to come back to this place and Diane is great! We loved having the bon fire in the back it was an incredible vacation thank you Diane for allowing us to stay at your home. Our stay at the beach house was awesome. I don't know who liked it more, the dogs or us....House was like being home and NO banging doors from other vacationers or drunks coming in all hours of the night like we find with condo's or hotels. 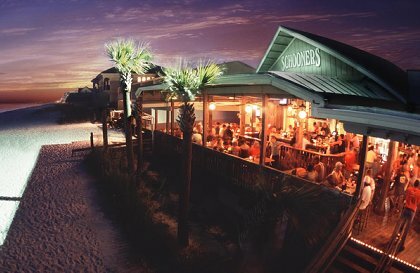 The beach was a very quick walk and schooners was a great place to hang out. We will come back as soon as possible... The dogs can't wait to come back to the house and the beach. Diane was great and we got into the house quick and easy. Also very clean and super cozy..
Our stay was short but very comfortable. The house was clean and cozy. Love the back yard with the fire pit. I must say it was my favorite part besides the location : ) The owner is super sweet and welcoming. Thank you again for your hospitality. This was a FANTASTIC vacation home. Very clean and very convenient to all attractions. Just a 2 minute walk across the street to the beach or Schooners for some music and food. My dogs were safe and happy in the fenced back yard and we could take them to St. Andrews with us or to the dog beach. The shower was EXCELLENT...great water pressure to get the salt off of you or out of your hair. Diane was very accomodating and friendly and her pizza place is the best on the beach. We will definately book again and recomment to all our dog loving friends. The house had a great screened in porch, two spacious bedrooms, wifi, cable...totally awesome. I would love to stay at Dianes house when I return to FL she was so nice and accommodating. I was really worried about renting a house off the internet, but Diane's house is as great as it describes in the listing-if not better!!! The beach is just a block away so it was a easy walk for my 3 and 7 yr old and the house is located in a nice/safe neighborhood. I loved that it was close to all the attractions and then I could go back to the house and have a quite relaxing evening in the large back yard which was also great for my dog because the yard is fenced in. We will be visiting Diane's beach house again in a couple of weeks. This will be our fourth year there! Can't wait to go back. I feel like I am at home the minute I walk in the door. We love that we can take our dogs on vacation with us! 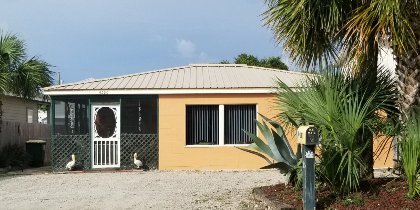 We stayed the second week of June.We were very pleased with our stay,it was convenient to the beach,restaurants and shopping.The house was comfortable and had everything we needed.We brought my dog and the fenced yard was great .Will stay again. My Daughter, Son-in-law, 2 Grand-Daughters and I stayed in Diane's Vacation Rental House, we all would highly recommend everyone to stay there on their vacation, too. The House is set up like a Home atmosphere, so much so, that my Granddaughter wanted to move there and live at the house!! It is only a couple blocks from the beach, which was great!! I would not even consider staying anywhere else, if we ever have the pleasure to do this again!! Diane is one of the nicest people I've met, and the cost for the Vacation Rental is very reasonable, too. My daughter did some research before deciding on this Vacation Rental, and they were very pricey! We stayed at Diane's beach cottage for a week in July. It was perfect for us and our toy poodle, Tiny Tim. Everything was neat and clean. We enjoyed sitting on the screened porch at night with the ceiling fan on and listening to a gentle evening rain. We used the gas grill on the back porch to charcoal steaks one night, and found the kitchen had everything we needed for the week. Diane was great to deal with. 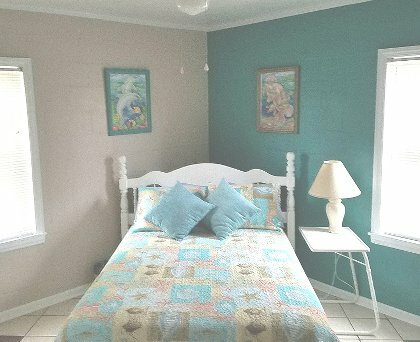 We heartily recommend this cottage as a place to relax and enjoy Panama City Beach. And while you are there be sure to try the pizza at Marco's. It's the best we've had in years! Loved this beach house! So close to the beautiful beach. The house was perfect for us. I highly recommend it (and Marios Pizza!) to anyone, especially if you like to take your pets. Definitly will be back. Thanks Diane! Dianne was very friendly & helpful; the house was very clean, fenced in back yard was very nice. The only negative we noticed was the shower head placement (a bit low). Pizza at Marco's was excellent. The king sized bed was very comfy. The walk to the beach was short & parking was available at the public acess point. Overall, our experience was great. We would definitely recommend. Wonderful vacation house for those with pets, kids or just a couple wanting to get away. Comfortable floor plan with screened porch and back deck with fenced spacious yard. The master bedroom has a great bed. The location is great for beach time and evening fun. If you have the chance to take advantage of this gem don't hesitate. Diney is very easy to deal with. We have stayed there each spring break, for 4 years. It is nice to take our dogs. Very nice area and walking to the beach. Property is always ready and Diane goes out of her way to accommodate. Highly recommend. Loved Diney's house! So comfortable and very clean. Neighborhood was very quiet and the house was a short walking distance to the beach and Schooners which we loved. Our little dogs we travel with felt at home, my husband and I hated to leave. One more thing, Marco's pizza is delicious, alot better than PaPa John's or Pizza Hut. Plan to return next summer. We stayed at this property in August and had a wonderful time. Very clean, quite and cozy. This property had everything. Was just like being at home. We will be visiting again next summer!! The owner also owns a pizza place that is close by with really good pizza!! be returning here as soon as we can. This is a great property! This rental has everything you need. We have stayed here (2) times now and plan to continue to stay at this property when visiting Panama City area. When owner say very close to the beach they mean only about a block away, easy walk and in a very nice neighborhood. Our pets enjoyed the stay as much as we did. This property is very well decorated and makes you feel very at home. The owner takes every effort to be sure that this property is 100% ready for you to visit and while you are there the owner is available if anything would come up. If we had to rate this property 1 - 10 this is a 10!!!! Hope you enjoy your stay at this beautiful home. What a wonderful little house. Well kept and Diane and her son were most concerned for our comfort and that we had all we needed. We have been to PCB for 15 years, but this time, staying in the Beach house was the best time ever! Everything you need in peace, quiet and comfort. My little poodle Bogie loved it!!!! !Especially trying to catch a chameleon..Thanks Diane! Great rental!! The location is close to the public beach and St. Andrew's State Park. Our teenagers loved the proximity to the beach in addition to the bikes, boogie board, etc. The fenced-in backyard was wonderful for our two dogs--they also enjoyed laying on the nice, cool tile floors. If you are looking for a pet friendly rental--this is it! We are back home in Missouri and missing the beautiful white beaches of Panama City Beach!! We had a wonderful time at Diane's house! The convenient location to the beach meant a SHORT walk for early morning shelling and evening sunset pictures. (4th of July fireworks were spectacular!) Being able to travel with our dogs was also a plus. Diane is very helpful, organized and prompt. This will be our first choice for PCB travel in the future! Diney's home was perfect for my husband and I and our small "gang" of pooches. Having tile floors, a wonderfully supplied kitchen, and a huge fenced yard worked well for us. Diana and her son were gracious and very helpful to us as rentors. This was the perfect pet-friendly rental. We had an awesome time at Diane's Beach House. It was close to all that we needed, clean, and you felt like home their. I know my family and I cant wait to go back. the Captain's Table seafood resturant in Panama City for some great tasting fish. Thanks again Diane for a wonderful vacation. My wife & i & youpi dog spent 3 months at Diney's place.Home is very confortable & Youpi dog enjoyed the fenced backyard.It is a low maintenance beach house which gave us a lot of free time for other things.Diane is very helpful, honest & always ready to help. Lots of restaurants close by which you could walk too.We enjoyed our winter very much.I have no problem recommanding this home to anyone. 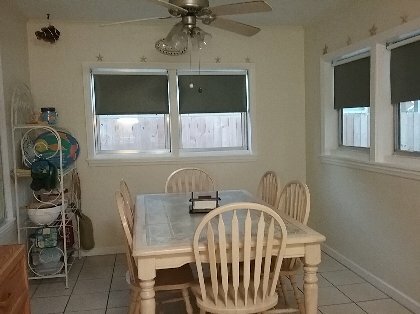 We stayed 3 months during the winter & found the place comfortable & warm.The low maintenance house was great.Large back yard for the dog to run.Also lots of restaurant near by.Diane is a super hostess & a very nice lady honest & reliable.I have no hesitation to recommend this vacation rental to anyone. April 15, 2003 Reviewer: Bill Redding From: Norcross, Ga.
My husband and 7 year old grandson and I stayed in this house for a week during spring break 4-2003 and had a great time. The house is large and very comfortable. It was very clean and well appointed. The front porch was great. Ceiling fans in all rooms keep you cool. The gulf is only 1 short block away and the house is in a very quiet location and accessible to many restautants. This is such a bargain and Diane and Penny were wonderful. April 15, 2003 Reviewer: Sherry Redding From: Atlanta Ga.
My husband, seven year old grandson and I stayed at this house for Spring Break 4-2003. It was wonderful and very spacious. The house was clean as a pin and only one block from the beautiful Gulf of Mexico. Diane has a great screened porch with a ceiling fan, and ceiling fans in the living room, kitchen, and both bedrooms. We really enjoyed the convenience of the house. The neighborhood was very quiet and close to some great restaurants. You simply cannot beat the price. We will certainly stay at Diane's house next year and for two weeks, not one. My grandson wanted to take the bunkbeds with him. Diane has done a great job of decorating, all in ocean motifs. We has a great time and Diane filled us in on all the things to do and places to eat. I recommend you buy Grouper and cook it on the grill off the kitchen. We really enjoyed staying in the house for spring break. It is very close to the gulf (one block) and very comfortable. This house is in a very quiet section and very clean and tidy. Diane was very nice and saw to all our needs. We will be back and recommend highly. The price was right and we enjoyed a very relaxing stay. The home was clean and well furnished, the owner was very gracious and helpful and we were very happy to be able to have our dog with us. 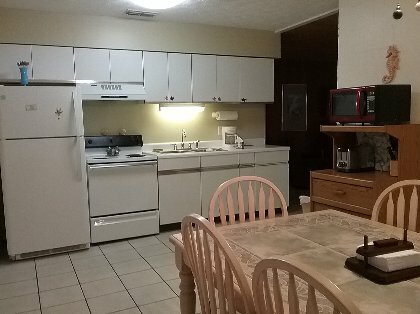 The home is very close to the state park and convenient to other PCB attractions. From the moment we arrived we felt at home. Dianne did everything she could and more to make our stay the best. The fenced-in yard was perfect for Beau (our little one). And the location is close to everything you need. We plan to come back very soon. No charge for children 16 years of age or younger. Extended stay, if available, is discounted. Cleaning and pet fees included in rates. No deposit required. Return guests are discounted. Cancellations and Refunds: I ask you please let me know asap of a cancellation. Required Stay: 3 days minimum.